I took a research trip back to Chernobyl for 2 weeks this Easter; it was mainly to do groundwork for the Chernobyling festival I am involved with organising. Looking at locations, having meetings, walking the routes, taking the train from Chernobyl to Slavutych with the power plant workers through Belarus etc. etc. It was a really good trip. One of the major highlights was meeting more of the self-settlers, the people who the festival is in aid of. 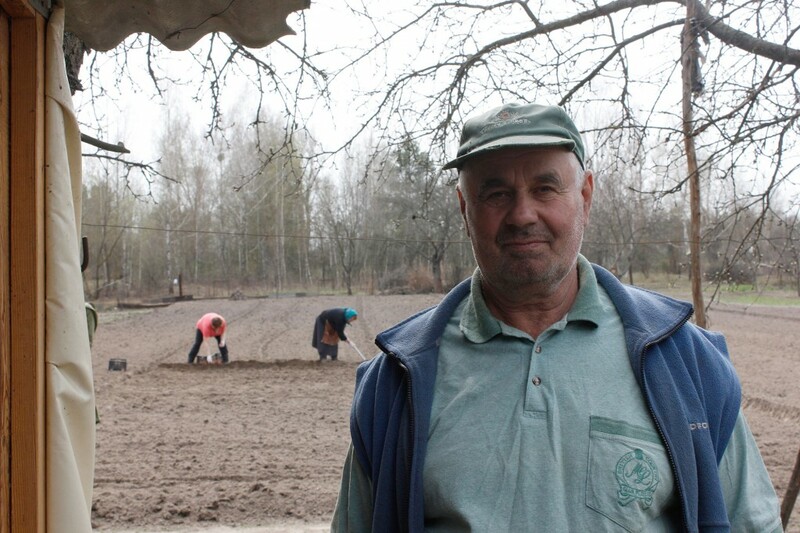 On Thursday 6th April we visited the village of Zalissa, the largest in Chernobyl, but one with no population. 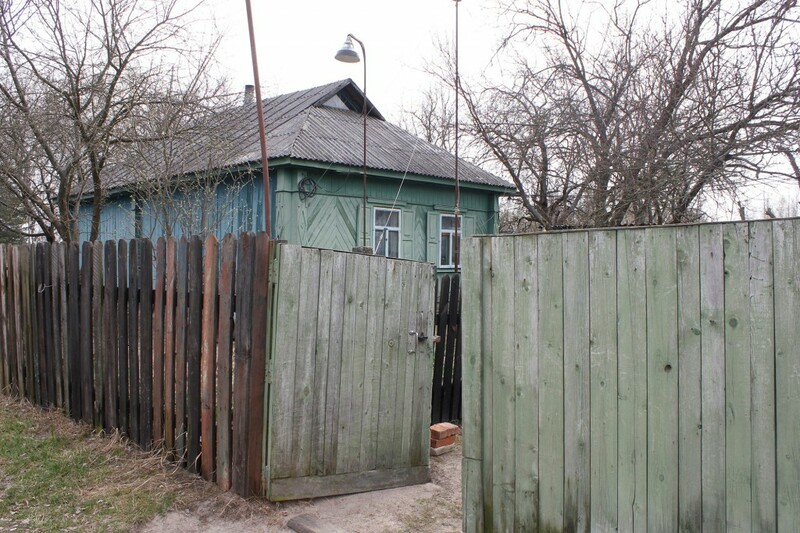 The Self Settlers (Samosely) of Chernobyl are those that refused to leave or returned the year following the nuclear disaster of 1986. 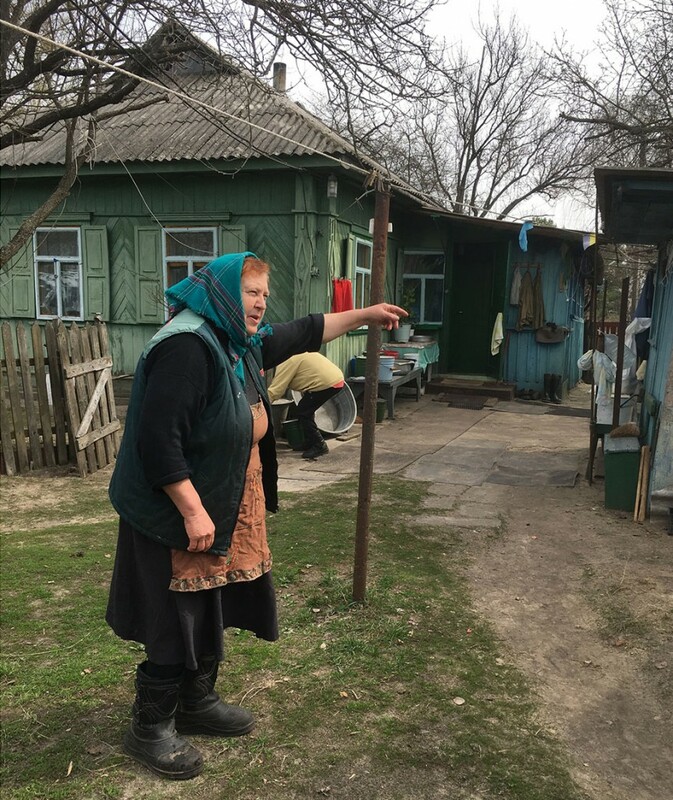 Vassi and Matrjona Nikolajewna Logvinenko are a married couple who live in this fishing village that used to be a popular destination for tourists coming on boats from Kiev. Pre 1986 this village had a large population now it is only 12. 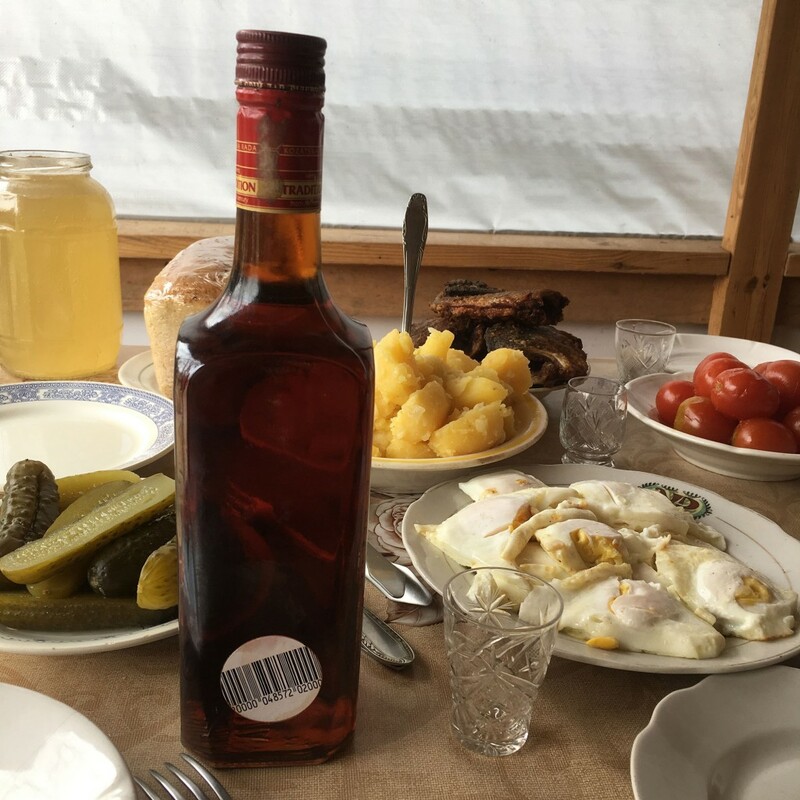 Our group (mainly from Chernobylwel.com) were invited for lunch and had to drink homemade vodka down in one (x 3), the food was plentiful, their kindness unequalled and the table laden down with fresh, mostly homegrown produce and eggs from their own chickens. Freshly fried fish caught by Vassi (from the river Pripyat) earlier that day, Russian salad, sausage and potatoes (grown in Chernobyl soil) that had been very lightly mashed (or were just a soft, powdery variety) and smothered in butter, we all ate it and it was like heaven. The egg yolks were sunshine yellow and fried in oil, the tablecloth was jolly and carefully laid for guests, we shared 4 glasses of birch juice made from sap collected from the silver birches in their fields and passed around the bread. It was just beautiful. Vassi sat smiling and nodding at us from the stool at the head of the table, carefully watching to see when a glass was drained so he could immediately order his guest to have another, and, afraid of offending, most of us did. 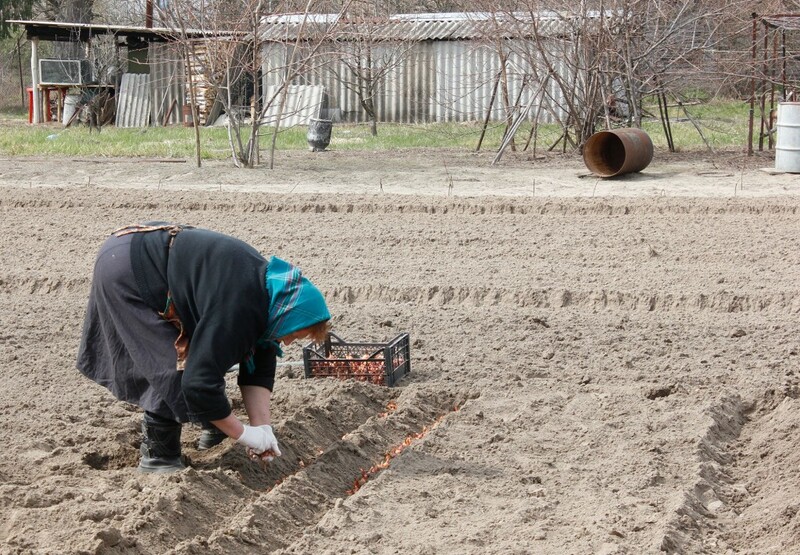 Matrjona didn’t stop for lunch herself, she continued to dig, sowing rows of onions one after another, there was no time, it had to be done, tomorrow was a religious holiday and no work could be done then. 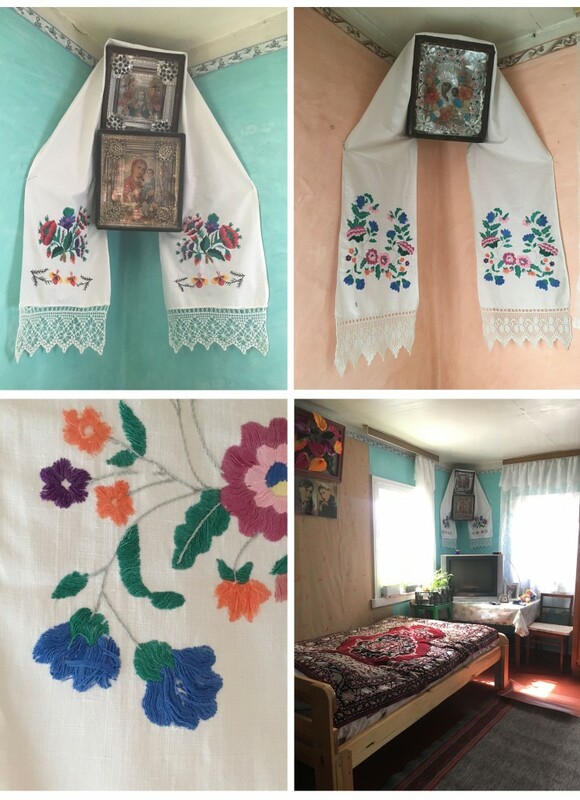 She directed me to go into the house and see some of her own old, favourite hand embroideries which were draped around 2 Jesus’, one high at each end of the house so He could watch over EVERYTHING. The colours had not faded and were meticulously worked in long satin stitch, the floral patterns echoing the simplistic apparent beauty of their country life. The couples remoteness was emphasised further by the high gate and fences around their tiny home, I’m not sure if it was to shut them further away from the abandoned homes close by or to keep out the wild animals. However, I am acutely aware that I am romanticising their lives; it is incredibly hard, they are extremely poor, it is very far to the nearest hospital, supermarket, everything we might take for granted. They need to be self sufficient, having little support. Like all the self-settlers, they engage in hard, physical, manual labour on a daily basis, and they are the two youngest self-settlers and in their early 60’s. Their homes are not structurally maintained and look like little more than shacks, although they are very well kept and clean. They suffer extreme winters and harsh weather. The soil is sandy here and difficult to work in places, and due to the radiation that has sunk into the soil, you are not supposed to eat anything grown in it anyway. The Chernobyling Festival is to raise money and awareness of these forgotten people left to fend for themselves in a now inhospitable landscape.